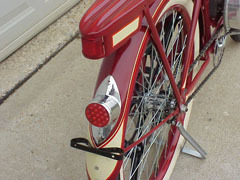 This very rare 1938 Roadmaster “Motor Master” bicycle, owned by John Stansbury was only built from 1938-1939, and only a handful survive today. 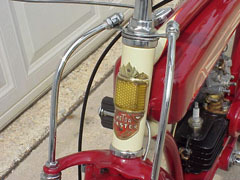 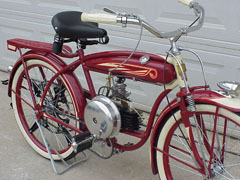 It was the only motorized bicycle produced where the gas tank was degined to fit the frame, much like the fake “gas tanks” on deluxe bicycles, but this one is real! 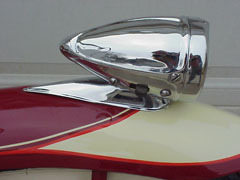 The engine was made by Evinrude, the famous makers of outboard boat engines. 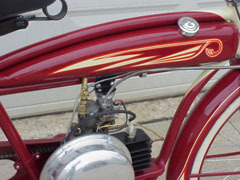 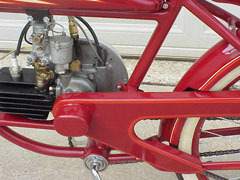 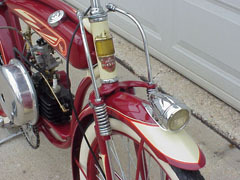 This bike was restored with the help of several people… Paint by Jeff Wilson, Dave Bagne rebuilt the engine, and Bill Salsbury who provided some rare missing parts for the engine. 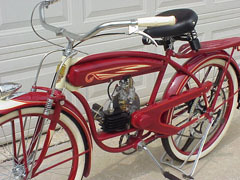 Awesome bike John!